How to Care for a REAL TREE! Hours: 10-5pm weekends after Thanksgiving until Christmas Eve! Riverpine Christmas trees has been helping families find their perfect Christmas tree for over 15 years. We are committed to building family memories and honoring 'Old World' holiday traditions. Riverpine has been the site of family gatherings, senior pictures, wedding proposals, and family bonding and memory building. 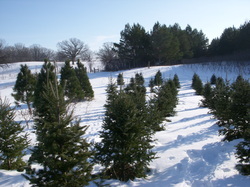 Ken Koob set out on a Christmas family mission in 1991, when he, and his wife Jan, planted the first plot of "practice trees" in our old family garden next to the Chippewa River on the south end of the farm. Since then he has been planting, trimming, mowing, moving, watering (with buckets and cow tanks out of the river) and taking special care of each and every tree on the farm. Ken is committed to providing others with a great opportunity to create memories with their families and sending them back to a more traditional way of harvesting the family tree. Ken was able to build his devotion to his family into an environment where others could balance the busy-ness of today's lifestyle and find a place to slow down with their family and enjoy the moment. We pride ourselves on being a true "Family Run Business:" with Ken being the head shaker, baler and trimmer, his daughter Tanya takes care of the gift shop with the help of her elves Kenna and Parker; Aunts, Uncles, Cousins come in to help out with holiday treats & work where ever needed; and daughter Tamara helps when she is home. It is a true family business and we are so blessed to have this support so that we can make each and every year a success. We are happy to provide many free services, including shaking, baling, cutting, and tying. In the giftshop we offer free cider, holiday treats, samples of product, and coloring books for the children. We organize a visit from Santa, and horse drawn sleigh rides, also free of charge on designated weekends. ​We hope that you have a great experience at Riverpine and that you are able to slow down and enjoy an "Old World" Christmas experience with your family this holiday season. Merry Christmas from the Riverpine staff! !